He is back and better than ever. I told you he was angry about not making the top 3 UEFA player of the year appearance. 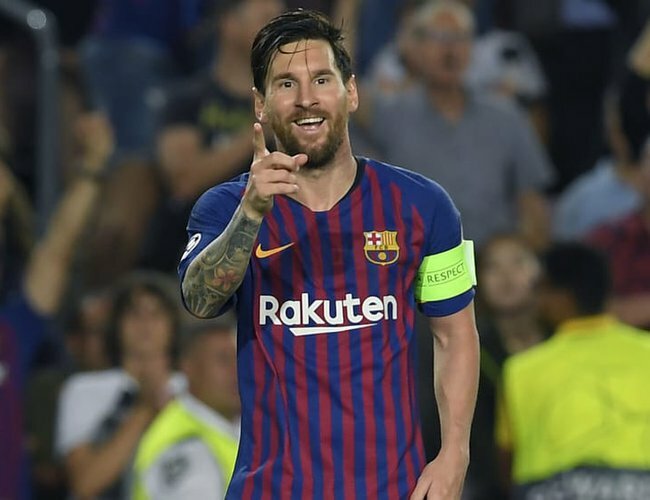 So he comes out and treats himself to a hat-trick in the opening 4-nil victory at the Camp Nou. My favorite of those goals was Dembele’s cheeky back heel flick that left two defenders in his wake and soon after he sent a net-seeking missile off his right foot. I was lucky enough to watch that goal in live action which lead me to a outstanding O. Before all your minds can go there… I saw the goal, my eyes bulged, pupils dilated, mouth dropped, and “ohhhhhhh wow” was all I could say in reaction to the World Cup Winner’s goal. PSV Eindhoven will need to soon forget that game and move on. PSV almost scored early with a Lozano lead run on a counter attack that looked similar to the one where he scored for Mexico against Germany in the world cup. If PSV can capitalize on those plays, they’ll be okay. They should be glad to have gotten this game out of the way early. I still have faith in PSV to pull through to the next stage. 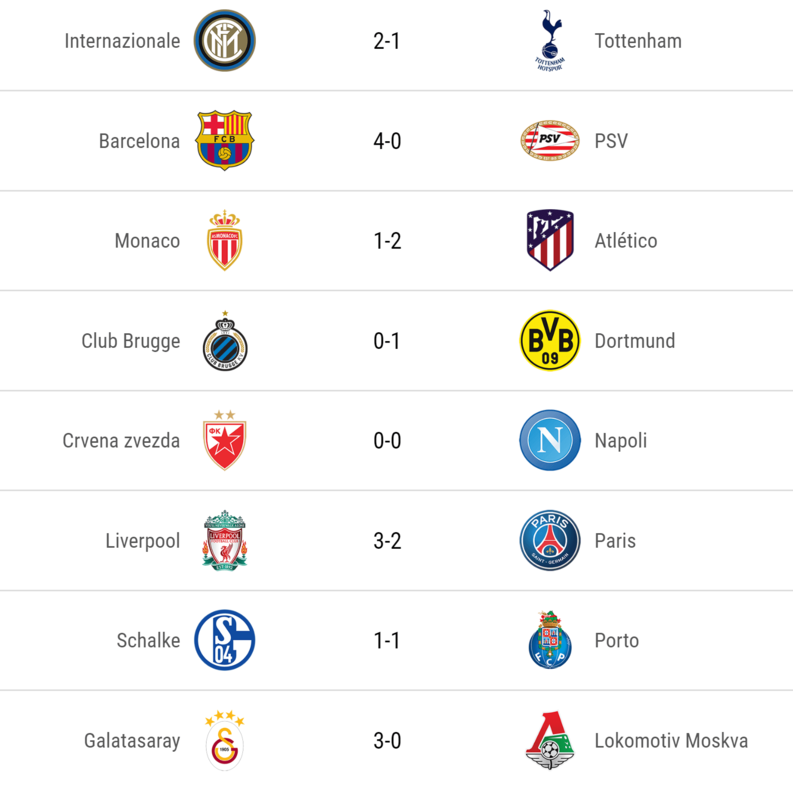 Inter and Tottenham are exactly who we thought they were. Italian teams not named Juventus seem to have upset lady luck. Tottenham’s Erikssen scored a 57 minute floater that had no business of calling itself a goal. But if it’s in it’s in. Great comeback by Inter with the late 93rd minute corner kick goal. Watch those highlights, or the full second half for fantastic work. One of those teams will do well in the Europa League but I don’t have high hopes for them here. Inter need to bring that same level of play to all 3 of their away games before I can convince myself they’re ready for the next stage. Admit it, when AS Monaco scored that forceful goal at home to Atletico de Madrid, you thought my “Atleti to the finals” prediction was as good as dead. But that is the beauty of football. One minute your losing, then in 45/halftime you’re predicted winning team is up 2-1 on the road against the crumbling Monaco. You saw Atleti keeper Jan Oblak whip his defenders in line and the team looked much more comfortable playing from behind. They could’ve scored 3 or 4 total if the goals themselves were a little wider as well. Atleti looked to be the stronger team. After watching the other two teams play, it will be very difficult to bet against Atleti in this group. Dortmund and Club Brugge underachieved in this game which saw it’s one and only late luck deflection turn to goal in the 85th minute. Who scored it? Well, no other than our American Christian Pulisic. He took a fortunate touch which went his way. The ball directed itself towards the net similar to throwing a magnet into an appliance store. The goal was inevitable. Club Brugge did hold their own and had plenty of early chances but Dortmund’s defense stood tall and true. Dortmund hardly left any open lanes for shots or through passes. They were the better team and deserved the game. Speaking of better teams; last year’s finalists Liverpool got off to a dramatic start. They took a first half 2- nil lead which PSG quickly responded to before halftime with a Meunier goal. With roughly 10 minutes left in the game, World Cup starlet and French youngster Kylian Mbappe got the opportunity to cross his arms in celebration with the tying goal. The game looked to be an even draw that was well deserved by both until the Brazilian Firmino went ahead and secured the early 3 points that Liverpool earned. Check out those highlights, you won’t be disappointed. After seeing the Napoli – Red Star Belgrade nil nil draw, I only have one message to both of those fan bases. Put the kids to bed before you tune in to watch your clubs play Liverpool or PSG, please. Group D…the group of cards. I predict that this group will be the scrappiest and most violent of all. I can see more yellow/red combinations out of this group than any other. Galatasaray start off with a 3 nil victory but lost their midfielder Ndiaye to a yellow+red combo suspension. I think Galatasaray should qualify out of this group with 3 easy home victories. That stadium in Turkey is one of the loudest and most intimidating places for visitors. It will be tough for Schalke and FC Porto when they come around. Both of which who split a point in Germany. FC Porto had the opportunity to win but only convert half of their penalty kick goals. I don’t see any team from this group in the round of 8. This group tugs at my heart. My childhood club that I followed with my Father, Godfather, Grandfather, and Uncle… is SL Benfica. I will always be a Benfica fan first before any other club I follow, and with that being said, it’s been a difficult road these past couple of years. (Look up the curse of Bela Guttman, you will understand my pain.) They held up very well at home against a strong but aging Bayern Munich. This Bayern team should not have a hard time with this group but I am concerned with the likes of Ribery and Robben who are beyond aged and in my opinion have zero business playing 90 minutes. The problem here is who will crack first, the team or the coach. It seems to be a re-occuring theme of Bayern. Dominate the Bundesliga and then underwhelm in the Champions League. If they fall short in this tournament, then I can easily see a rebuild for the 2019 campaign. Ajax looked powerful. I watched this game and saw that they had a little bit of trouble scoring at first but AEK Athens presented little to no danger when they got a few turns to attack. The second half was an easy bet for Ajax to take the win as they pounded three past the Greek club. Shaktar vs Hoffenheim. Not a bad game to watch the highlights on but I don’t have much input on either team other than the easy cash I took on the total goals over. Oh yeah, that their draw pins Manchester City into last place. MC start their Champions League campaign the same way they ended the last one. Disappointing loss at home to a team that was pronounced dead on arrival. It is too early to kill off the English Premier League Champions just yet and the draw between Hoff/Shaktar could either hurt or help Manchester City as long as they don’t drop 3 points in anymore of their games. Lyon could not have placed themselves in a better position with an away win against the favorite team in the group. That failed transfer of Fekir to Liverpool was the best thing to happen to these boys. Hopefully they take that momentum with them into their Ligue 1 games and move up the field. The reigning Champions Real Madrid, could not have an easier and more fortunate group. They hosted who should be their toughest opponent AS Roma. Real took care of business in the most Real of ways. 3 nil victory with their #7 putting an exclamation point on the final goal. That number 7 is none other than the re-acquired Dominican starlet (shout-out to my Dominican familia) Mariano Diaz. So far that man is filling in those shoes CR7 left behind quite well. I am certainly an early believer of this young man and this team. They just seem more free without CR7 taking over the left side of the field. Bale and Asensio do such a great job at rotating and confusing defenses, leaving Benzema open usually for easy goals. 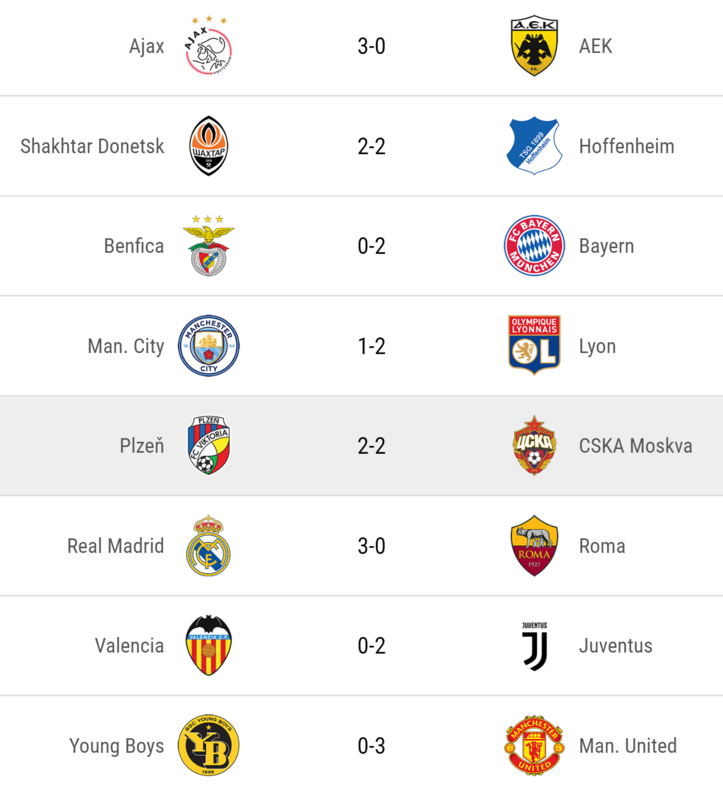 Plzen and Moscow, who I don’t have much input on, did eachother a favor by splitting the points. Roma needs to dig themselves out of a hole that is completely possible this early in the tournament. 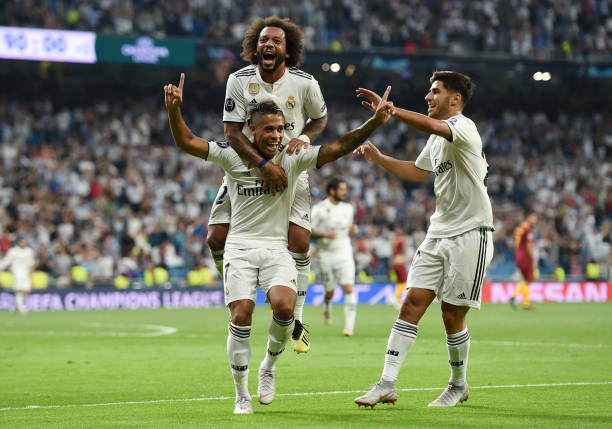 Finally, you have the finally and by far the one group with the most controversy, Group H. Ronaldo’s debut in the Champion’s League ended short with a suspect red card in the 30th minute. I could go on all day on the issues at hand leading up to Ronaldo’s return on Spanish soil against Valencia, but I won’t. We could discuss paying Spanish taxes and a hat trick in the World Cup opening match….but if you want to discuss it, just @ me on twitter. Great win for bettors who took Juve against the spread. Pjanic converted 2 penalties which could have easily of been CR7’s opening goals for the Italian giants. Either way, they got the 2 nil win with 10 men away from home. Talk about clutch. Here’s the unfortunate story, no Ronaldo in Old Trafford when Juventus plays Manchester United away next. It should still be a great game regardless. It’s just a shame Ronaldo will miss playing against his former club and manager. A club which also secured an easy 3 points on the road against Young Boys. This group should be fun to watch even if we already have our expectations set with who will advance. This was fun, I hope you enjoyed it. Please leave some feedback, I’d love to have a discussion with my readers.